Our 82nd season offers an exciting array of internationally acclaimed artists. Single tickets are now on sale! MAR 29 — Havana Cuba All-Stars: ASERE! Click for a printable version of our Ticket Order Form. Questions? Please call us at 505 984 8759. We are glad to help! Buy early. Get great seats. Pay less. 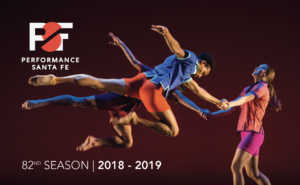 Subscriptions are available from April 2 and June 1, 2018 and only through the Performance Santa Fe office. 20+ Flex Subscription: Build your own subscription of 20 or more tickets to receive a 25% discount. 12-19 Flex Subscription: Build your own subscription of 12-19 tickets to receive a 15% discount. 6-11 Flex Subscription: Build your own subscription of six-11 tickets to receive a 10% discount. Click for a printable version of our Ticket Order Form. Download, fill out, and return to Performance Santa Fe, 300 Paseo de Peralta, Suite 102, Santa Fe, NM 87501. SPECIAL BONUS FOR SUBSCRIBERS! To thank you for your loyal support, Performance Santa Fe now offers a benefits card as part of your subscription. There is no additional fee for the card, which is provided with your subscription. The card features discounts at local restaurants and special offers from popular Santa Fe businesses. Thank you again for your support and we look forward to seeing you during our 82nd season! Subscription tickets may not be refunded, but may be exchanged by calling the Performance Santa Fe office. Subscription tickets may also be returned to Performance Santa Fe as a tax-deductible contribution. Single tickets are available beginning June 4, 2018 through Performance Santa Fe and TicketsSantaFe.org. Performance Santa Fe makes every effort to ensure you have the best experience possible when attending one of our performances. Please feel free to contact us if you have any questions, or if we can help in any way to make your experience more memorable. Parking: We suggest arriving 20 minutes before any scheduled start time to park, socialize prior to the performance, and locate your seat. Dress: Santa Fe is a casual town and there is no set dress code. Most people wear clothing appropriate for a cocktail party to business casual. Please refrain from wearing any strongly scented products and be mindful of jewelry and accessories that make noise. Late seating: Late seating will be allowed only after the conclusion of a complete work or movement, or at the discretion of the artist. Accessibility: If you need wheelchair seating or any other special assistance, please specify your needed accommodation when purchasing tickets. Discounts: Group discounts are available—just ask! Students and teachers receive 50% off ticket prices to all performance. Exchanges & Refunds: Tickets will not be refunded. Only subscribers may exchange tickets for another performance. Tickets can be returned to Performance Santa Fe as a tax-deductible contribution. Please call us at 505 984 8759. We are glad to help!